Plast-O-Matic Valves' PRA series pressure reducing valve is designed for highly corrosive and ultra-pure chemicals. The design uses compressed air and two rolling diaphragms to control liquid pressure with greater accuracy. 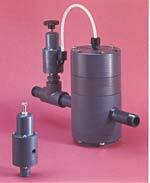 The valve can handle inlet pressure up to 150 psi and accurately maintain a downstream pressure from 5 to 125 psi. The design features two opposing, large-area, frictionless, rolling diaphragms. Process pressure is applied to one of the diaphragms and air pressure is applied to the other.